This article, which will be printed in the Times's Arts & Leisure section on Sunday, has been published online with a slide show of Josiah McElheny's works, available at the link above. JOSIAH McELHENY'S studio is strangely unremarkable. A narrow office furnished with a desk, a drawing table and library shelves packed with books, it betrays few signs of art making, just a couple of rows of neatly pinned photocopied images and black pencil drawings on one white wall. It's not the work space one expects from this Brooklyn artist, known for dazzling glass works like "Endlessly Repeating Twentieth Century Modernism," a shimmering display of mirror-glass decanters that seem to go on infinitely, and "Island Universe," a suite of five room-size silvery sculptures that illuminate the Big Bang theory. Where's the flaming furnace? The globs of molten glass? But a few hours spent with him there recently — during which he expounded on influences like Czech modernism, the 19th-century German writer Paul Scheerbart and various obscure historical incidents — demonstrated why this room, where he researches and draws, is more important to his work than his small glass foundry, also in Brooklyn. In a medium known for work many regard as lightweight and decorative, Mr. McElheny's creations strive to convey sophisticated, often dark ideas. "McElheny brings historical narratives into his work, blending those in an incredibly rich and challenging way," said Edward Saywell, chairman of contemporary art at the Museum of Fine Arts in Boston, which made "Endlessly Repeating Twentieth Century Modernism" a centerpiece of the new contemporary art wing it opened last year. 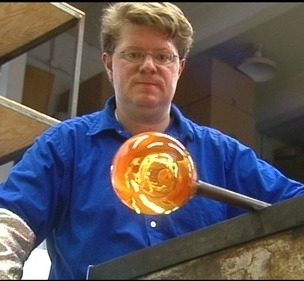 "He has boundless curiosity and ambition to connect across time periods, literature and history as a way of enriching his work" — making his work very different, Mr. Saywell noted, from the flamboyant spectacles created by Dale Chihuly, the best-known glass artist, to whom the museum devoted an exhibition last year. The result, as the MacArthur Foundation wrote when it gave Mr. McElheny a "genius" grant in 2006, is a "new, multifaceted form of contemporary art." Detail from "Endlessly Repeating Twentieth Century Modernism"
Over the next year Mr. McElheny will have his own big bang, a constellation of exhibitions that will reveal his work —in glass and other mediums — in more depth than ever. It started last month in New York, with a show of new work addressing fashion, abstraction and identity at Andrea Rosen Gallery, up through the end of June. 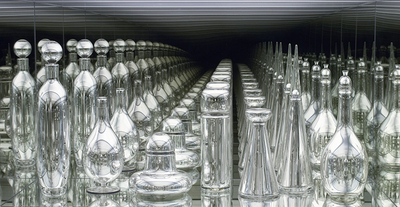 In Boston on Friday, the Institute for Contemporary Art will open "Josiah McElheny: Some Pictures of the Infinite," a midcareer survey that will unveil a major piece about the cosmos, "The Center Is Everywhere." 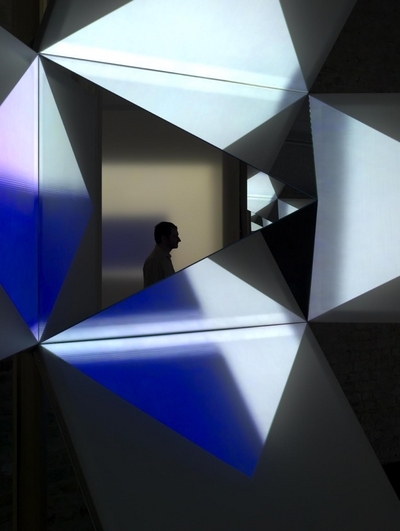 In London seven large sculptures, all involving mirrors that reflect abstract films, are on view at the Whitechapel Gallery through July 20. Other events will follow, including a show at the Donald Young Gallery in Chicago in September relating to the Swiss literary modernist Robert Walser, and the premiere during Art Basel Miami Beach in December, at the Vizcaya Museum in Miami, of a film reimagining Scheerbart's story "The Light Club of Batavia." And next year the Wexner Center for the Arts in Columbus, Ohio will present a survey of his work, "Towards a Light Club," focused on modernism. Oddly, given all this interest, Mr. McElheny said he is "still trying to figure out how art works." People see the wonder and beauty in his pieces, he said, but often miss, or dismiss, the meaning. What many deem his most successful work — that seductive mirrored decanters series — he calls a failure because so few viewers seemed to recognize its troubling aspects. "A bunch of things repeated endlessly?" he said. "That's a nightmare to me, an image of the horrible implications of modernism, that you never need to make another bottle design again. Isn't that the worst? What makes life interesting is change." "There is a disconnect between what I do and what's perceived," he added. "I struggle with it all the time." At one point he wrote wall labels to accompany his works, but he is still smarting from a review in 2000 that reacted to these explanatory texts with the charge that he had created a "pointless Conceptual conceit." A constant reader, he researches widely to develop his ideas. For an exhibition of four sculptures in 2007, he said, he and an assistant worked copiers at a public library for five days, eight hours a day, capturing images of decanters and other vessels. "I put them in notebooks and choose from them," he said. "They go into another notebook, and I make drawings from that." The resulting work is often aimed at "correcting" history, as Mr. McElheny put it, sometimes addressing elements that have been left out — like the contributions of factory workers to design innovations or the roles of female partners of male artists in their work — through his titles or writings, for example. Other times he retells narratives. For his film of Scheerbart's utopian fantasy about a spa where people bathe in light rather than water, he is using archival photographs showing the grand Vizcaya villa in its early days in the 1910s. Mr. McElheny "has the ability to play with history and fantastic plausibility," said Flaminia Gennari Santori, the Vizcaya Museum's deputy director. The version of events in the work "hasn't quite happened, but it could have, and that gives him huge room for poetry and imagination, reflection and criticism, on history of the past." Mr. McElheny's big new piece for the Institute of Contemporary Art show, "The Center Is Everywhere," came out of a suggestion by the cosmologist David Weinberg, his collaborator on the Big Bang series. It maps a dime-size patch of the sky onto a 32-inch metal disk that will be suspended from the institute's ceiling and from which 300 brass rods will descend, each ending in a crystal or light bulb whose shape and size correspond to those of a star, galaxy or quasar. As part of the piece Mr. McElheny has printed letterpress books of the first complete English translation (which he commissioned and edited) of a prison novel by the 19th-century French socialist Auguste Blanqui, which suggests that the formation of the universe was anarchic and anti-authoritarian and might possibly provide a model for an egalitarian world. Two of these books will be displayed at the museum. The Rosen gallery exhibition was a different matter. Mr. McElheny returned to a past subject, fashion, which is "one foil for him," Ms. Rosen said. "It seems neutral but is completely charged with politics and history." But the process was not easy: Mr. McElheny worked for a year on the show before deciding to throw everything out and start again. Stuck, for the first time he invited other artists, friends in Brooklyn and the Lower East Side, for studio visits. "It helped a lot," he said. The blown-glass works he ultimately came up with, inspired by artists like Lucio Fontana, Kazimir Malevich, Sonia Delaunay and Varvara Stepanova, make abstract reference to the human form and speak to the way people build their identities with clothing. He also made two "performative" mirrored glass sculptures that are worn in the gallery by actors, an allusion to Ralph Ellison's "Invisible Man," among other things, and four clear-glass wall hangings that refer to the Bauhaus artist Oskar Schlemmer, whose costume designs turned the body into abstractions. Will viewers get any of this? Mr. McElheny acknowledges that his choice of primary medium, which dates to his days as a student at the Rhode Island School of Design in the 1980s, doesn't help. "Yes," he said, "using glass is part of the problem." Still, he added: "When I teach, I say you can't choose your ideas. You can't choose who you are. I use glass because of my own history, and glass comes with an inherent response." But glass also presents an opportunity, Mr. McElheny suggested, noting that it's a universal tool for looking. In the end, he said, it's not the glass that's important, "it's what you see through it."